Born into the beautiful bedlam of downtown New York in the eighties, iO Tillett Wright came of age at the intersection of punk, poverty, heroin, and art. This was a world of self-invented characters, glamorous superstars, and strung-out sufferers, ground zero of drag and performance art. Still, no personality was more vibrant and formidable than iO’s mother’s. Rhonna, a showgirl and young widow, was a mercurial, erratic glamazon. She was iO’s fiercest defender and only authority in a world with few boundaries and even fewer indicators of normal life. At the center of Darling Days is the remarkable relationship between a fiery kid and a domineering ma—a bond defined by freedom and control, excess and sacrifice; by heartbreaking deprivation, agonizing rupture, and, ultimately, forgiveness. 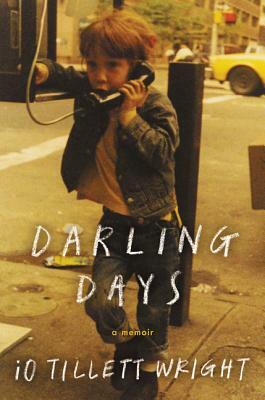 Darling Days is also a provocative examination of culture and identity, of the instincts that shape us and the norms that deform us, and of the courage and resilience it takes to listen closely to your deepest self. When a group of boys refuse to let six-year-old, female-born iO play ball, iO instantly adopts a new persona, becoming a boy named Ricky—a choice iO’s parents support and celebrate. It is the start of a profound exploration of gender and identity through the tenderest years, and the beginning of a life invented and reinvented at every step. Alternating between the harrowing and the hilarious, Darling Days is the candid, tough, and stirring memoir of a young person in search of an authentic self as family and home life devolve into chaos. iO Tillett Wright is an artist, activist, actor, speaker, TV host and writer. iO’s work deals with identity, be it through photography and the Self Evident Truths Project/We Are You campaign or on television as the co-host of MTV’s Suspect. iO has exhibited artwork in New York and Tokyo, was a featured contributor on Underground Culture to T: The New York Times Style Magazine, and has had photography featured in GQ, Elle, New York Magazine, and The New York Times Magazine. iO is a regular speaker at universities, discussing expanding one’s circle of normalcy and embracing those that are different than you. A native New Yorker, iO is now based in Los Angeles.